Secretly Smitten Live Webcast Tonight! 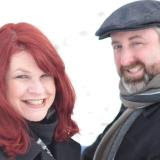 Readers of the wildly popular Smitten series will have the chance to connect with the authors during a live webcast on February 28 at 8:00 PM EST (5:00 PM PST) in honor of the recent release of Secretly Smitten (Thomas Nelson/January 8, 2013/ISBN 978-1401687137). The writing team ofColleen Coble, Kristen Billerbeck, Denise Hunter, and DiAnn Hunt will be debuting the animated Secretly Smitten trailer, giving away prizes, and discussing both the book and their unique and collaborative friendship. They’ll also be answering audience questions and testing readers’ trivia skills. The webcast will be hosted on the Thomas Nelson Fiction Facebook Page. For anyone who does not have a Facebook account, they can join the live event via the Litfuse Publicity Group website. Those who plan to attend are encouraged to RSVP and set up a reminder by visiting either page, then sharing the event via their own social media accounts. Join popular romance novelists—and real-life best friends—Colleen Coble, Kristin Billerbeck, Diann Hunt, and Denise Hunter for four delightful intertwined tales of mystery and sweet intrigue. RITA-finalist Colleen Coble is the author of several best-selling romantic suspense novels, including “Tidewater Inn”, and the Mercy Falls, Lonestar, and Rock Harbor series. Denise Hunter is the award-winning and best-selling author of several novels, including “A Cowboy’s Touch” and “Sweetwater Gap.” She and her husband are raising three boys in Indiana. Together, the ladies blog at http://www.girlswriteout.blogspot.com/. Amelia is heading to America to meet a man she’s been writing, a man who paid her and an aunt’s passage on the Titanic, so they could meet in person and investigate the possibility of a union. A cousin is also supposed to accompany the women, but he was thrown in jail the night before passage. When Amelia sees a stowaway being thrown off the ship, she runs after him and gives him her cousin’s ticket so he can have a fresh start. Quentin Walpole is an American by birth, but an unfortunate event in his childhood spells the route for ruin. While his father and older brother thrived, Quentin lived as a homeless man. Desperate for a new beginning, Quentin boards the ship, but is surprised to discover his father and brother are also on board. When Amelia discovers the truth of Quentin’s identity she works to reunite him with his family. But as Amelia works to reconcile father and son, she finds herself the object of both brothers’ affection. Can she choose between two brothers or the suitor waiting on land? Or will she lose everything to the icy waters of the Atlantic? BY THE LIGHT OF THE SILVERY MOON is a book I long awaited reading since I read the press release on it, probably around this same time last year. It is centered around the famed maiden voyage of the Titanic, so you know there will be lots of drama. I love Ms. Goyer’s historical books, and this one is no different. Ms. Goyer is a top must read historical author for me. Her research is detailed and the characters transcend time and come to life on the pages of the book. My heart broke for Quentin from the prologue, and I wondered what would become of that poor child, but thankfully I didn’t have long to wonder. 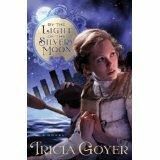 If you like historical fiction you won’t want to miss BY THE LIGHT OF THE SILVERY MOON. The lyrics of the original song are included at the end of the book in their entirety. Recommended. $12.99. 320 pages. Include comment to be entered in giveaway! Include contact information. What kind of research did you do for Claiming Mariah? Generally, I read over my history books for a certain area, or go online to the chamber of commerce and view the tourist information if that’s an option. My research about specific details crop up as the story develops. I might need to know if the railroad is in an area at a certain point of history. Or when barbed wire introduced to the area? What kind of pistol would my hero carry? What kind of wagon or buggy would they have used? If something like that inserts itself into the story, and I don’t know the answer, I find out. How did you come up with the plot for Claiming Mariah? Several years ago, I read a novel where a bank robber tosses a sack of stolen money in the back seat of a hand-to-mouth college student’s car. She kept the money and eventually started a very successful business. She justified her actions because she anonymously created a charity to help destitute young women get back on their fee. But, as the old saying goes, two wrongs don’t make a right, and that wasn’t quite right from a Christian’s perspective, was it? I based Claiming Mariah on the following question: “What would a Christian do if they found out their whole livelihood had been based on a lie?” Mariah does the right thing by writing to Slade’s father asking for forgiveness, but the consequences of her actions end up being way more than she bargained for. 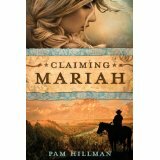 When Mariah Malone’s dying father confesses that he cheated his partner out of the gold used to buy the family ranch, she writes a letter, offering restitution. But when the son of her father’s victim demands the entire ranch, she stands to lose everything. As these two let go of the bitterness of the past, Slade Donovan has to learn to forgive Mariah, her father, and God, while Mariah must learn to overcome her pride. The account of Yellow, the half-wild tomcat and his precarious beginnings after being born in the woods, is an almost exact retelling of a cat that I befriended several years ago. I had to work for that cat’s trust, just as Mariah earns the trust of both Slade and Yellow in Claiming Mariah. I was born and raised on a farm, and from an early age I loved horses and all things western. I was a bit of a tomboy and cut my teeth on Louis L’Amour westerns. While I don’t necessarily use my personal life as inspiration, I write what I know when it comes to country life, farming, ranching, and hard work. My favorite genre to read and to write is the historical romance genre, especially westerns, harking back to my Louis L’Amour and John Wayne days, I guess. That’s not to say that I don’t enjoy other genres and other time periods, because I do. Probably the biggest impact is that I know all kinds of details about the oddest things. Just recently in a conversation over dinner, a woman couldn’t imagine writing historicals and getting the facts right. Years of reading historical fiction and non-fiction will cement details in an author’s head. The key is to listen to that niggling voice that alerts you when you don’t know something and to take the time to find out the correct date, or location, or term before your book goes to print. Until very recently, I worked a day job as a purchasing manager for an OEM company. But after holding down a full-time job, a part-time job as conference treasurer for ACFW, writing, and being a wife and mother, (I figure all of that together constitutes 3.5 jobs. Wouldn’t you agree?) I now only have 2.5 jobs. My first books were written in fits and starts sandwiched in between all my other jobs. Now that I’m working from home, I’m still trying to find my most productive way of writing. It’s a combination of both: writing every day, but I’m sure I’ll have to set aside large blocks of time when deadlines loom. I work best with complete quiet and no interruptions. My best time to work is mornings while my brain is fresh, but I’ve been know to work into the wee hours of the night as well. Once I’ve brainstormed the backbone of the story, and I become immersed in their world, the characters and the situations they find themselves in become my inspiration. I’m on my computer almost 24/7 either checking/responding to email, interacting through social media, writing, researching, taking care of business, the list is endless. In addition, since my books are ebooks through Tyndale’s Digital First Initiative, I can’t imagine not using the internet’s social media resources as my primary outlet for promotion. In the end, writers, just like any professional who uses electronics to get their job done, must weigh the time they spend on all of these activities. I haven’t based any characters on someone I’ve encountered on social media. It’s not that I’m against that, it’s just that I just haven’t had one of those “aha” moments that triggered something like that. Although I have run into some interesting characters on facebook…. Seattle: It’s never too early to introduce your kids to a regular devotional routine or ways in which they can let their light shine in their daily lives. The Shine Your Light Devotional (Tommy Nelson/February 19, 2013/ISBN 978-1-4003-2069-1/$16.99) by renowned Bible teacher Sheila Walsh allows parents to do just that. On February 26 at 8 PM EST/5 PM, Walsh will be hosting a webcast to connect with moms and highlight this new release. Young girls need to know that they can be bright, shining lights for God—and this new devotional will teach them to do so by thanking God, learning His Word, telling others about Him, and showing His love to everyone they meet. More than 50 devotions help girls see that God wants us to learn about Him and to put His Word in action. Memory verses, prayers, “Shine Your Light” activities that focus on serving God each day, and devotional thoughts explore how little girls can be more like Jesus. With lots of sparkles and even more great biblical applications and encouragement, the Shine Your Light Devotional is sure to be a favorite part of a little girl's day. The Shine Your Light Devotional incorporates artwork from Walsh’s latest series of God’s Little Angel™ storybooks. These stories follow on the heels of Walsh’s wildly successful God's Little Princess series, which has won the National Retailer's Choice Award twice and is the most popular Christian brand for young girls in the US. During the February 26 interactive webcast, the audience can submit questions for Walsh to answer, join a live chat with other parents, and be eligible to win a variety of prizes, including copies of Shine Your Light. Participants can join the webcast via the author’s Facebook page or for those who do not have a Facebook account, the Litfuse Publicity Group website. Sheila Walsh is a powerful Bible teacher and best-selling author from Scotland with over 4 million books sold. A featured speaker with Women of Faith® conferences, she has reached more than 3.5 million women by combining honesty, vulnerability, and humor with God's Word. Sheila is the author of the best-selling memoir Honestly, the Gold Medallion Award nominee The Heartache No One Sees, the Retailer's Choice Award nominee Beautiful Things Happen When A Woman Trusts God and the Gigi, God's Little Princess series, which has won the National Retailer's Choice Award twice and is the most popular Christian brand for young girls in the US. She just released her newest book and DVD Bible study for women The Shelter of God's Promises. In 2012, she released her life-message book God Loves Broken People. Currently completing her Masters in Theology, Sheila lives in Frisco, Texas with her husband, Barry, her son, Christian, and her two little dogs, Belle and Tink. 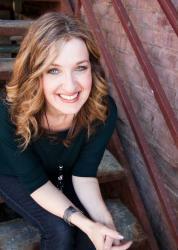 To learn more about Sheila Walsh and her books, visit www.sheilawalsh.com. She is also active on Facebook (@sheilawalshconnects) and Twitter (@sheilawalsh). Joi Copeland is married to a wonderful man, Chris, and has three amazing boys, Garrison, Gage, and Gavin. She is living the dream in beautiful Denver, Colorado. Joi loves being a wife and mom! She enjoys spending time with her sister Steffanne, and loves to sit and have a cup of coffee or tea with friends! She's been a Christian for over twenty years. Following Jesus has been the best decision she has ever made. Joi's other books are Hope for Tomorrow, Hope for the Journey, Christmas Rayne, and Sheriff Bride Rob's Story. What kind of research did you do for Letters of Love? I had to do a lot of research in regards to what role my grandfather played in the Army. He was a part of the O.S.S., which is the modern day C.I.A. I also had the great opportunity to read all the letters he wrote to my grandmother. The story is based off of those letters. While reading them, the book took form in my head. Sophia's grandmother, Lucia Snell, gives her an early inheritance; letters written to her by her husband while stationed in China during World War II. Lucia believes these letters will help her granddaughter heal from the heart-wrenching tragedy she faces. Will Sophia carry the anger, bitterness, and guilt within her or go to the only One who can heal her from the pain? 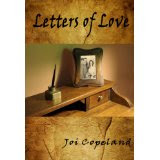 Will she find the strength to carry on and the will to survive through her grandparents' Letters of Love? \What role have your life experiences played in the characters and/or the situations you develop in your books? I think for me, my characters are all a part of who I am, the good, the bad, who I want to become. I can see myself in each character (mostly female). The situations really depend. At times, they can be based on something I'd gone through to a certain extent, but when I pray about what I should write, I try to hear what God directs me to. Always a parallel, I think. I use my life and others' as a source of inspiration. Laura Hilton (not just saying that, it's true), Francine Rivers, Lisa T. Bergren, Bonnie Blythe. The list goes on and on! I love historical romance, contemporary romance, amish. I love to read, always have. By reading, I am able to learn my trade better. I typically start to read a book with the thought, “What can I learn?” both spiritually and writing related. I often get so sucked up in the story that I forget about the writing related part and have to go back and reread it! I try to write every day. When I worked, I had to have designated time. Christian music playing in the background. The internet can be helpful with reviewing and advertising. I met one gal online because she won my book on a contest. Since then, she's been amazing at getting new readers my way. I spend a lot of time trying to get interaction between me and readers. It can be incredibly useful, but then, it can also side track me. I have to be careful. I don't really observe on facebook. I do that through personal relationships or by watching people from a distance. Have you ever received a letter that was life changing? If so, tell us a little about that, and do you still have that letter? Where is God in the midst of this? You’ve probably heard that question or perhaps asked it yourself. In the battle for your joy, your marriage, your finances, your health, an emptiness creeps in. Where is the peace You promised, God? Bo Stern has been there—and is still there. Yet in studying the battles in Scripture, she came to a startling conclusion: God is using these fierce fights in our lives for an astonishing purpose. BEAUTIFUL BATTLEFIELDS is written in conversational style which almost feels as if Ms. Stern is sitting across the table from you, sharing her personal story—along with others. A renowned speaker, she shares stories of a woman who was abused sexually, for half of her life. She shares the raw emotions associated with her husband’s diagnosis with ALS, and how he has been able to expand his ministry as a result. 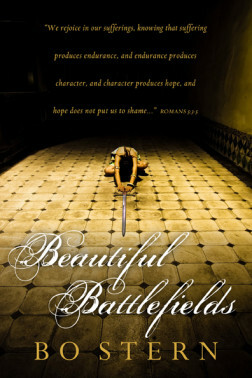 In BEAUTIFUL BATTLEFIELDS, Ms. Stern answers the questions—in a very real way—about why God allows suffering. Can He use the pain that you (and others) work through? She also shows us how to find the beauty in the hard places, and strategies for growing stronger through the battles. $14.99. 192 pages. 5 stars. Where is God in the midst of this? You've probably heard that question or perhaps asked it yourself. In the battle for your joy, your marriage, your finances, your health, an emptiness creeps in. Where is the peace You promised, God? Bo Stern has been there-and is still there. Yet in studying the battles in Scripture, she came to a startling conclusion: God is using these fierce fights in our lives for an astonishing purpose. Bo Stern knows the most beautiful things can come out of the hardest times. Her Goliath came in the form of her husband's terminal illness, a battle they are still fighting with the help of their four children, a veritable army of friends, and our extraordinary God. Bo is a teaching pastor at Westside Church in Bend, Oregon. Find out more about Bo at http://www.bostern.com/. Teresa is planning her marriage to James, after completely surrendering to the Amish church, and her future father-in-law has come to grips with his son marrying a formerly Englisha girl who had a baby out of wedlock. Susan is still struggling to find her place. She has allowed Thomas to come calling again, but there’s another young man in the picture, Steve. Susan is confused about which one might be God’s will for her life. Also, Susan’s father must confess to a sinful transgression he’s hid for years. Will he be able to face the church discipline and possibly more? 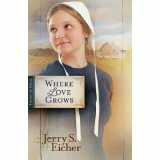 WHERE LOVE GROWS is the third book in Mr. Eicher’s Fields of Home trilogy. Readers will want to read the first two books in the series, Missing Your Smile, and Following Your Heart as these books are not stand alone. Fans of Mr. Eicher’s books will love Susan. She – and her struggles, as well as the other characters issues – are very real and will tug on reader’s heartstrings. The ending is very sweet – and satisfactory. Good read. Recommended. 4 stars. $12.99. 320 pages. As much as we would hate to admit it, most of us struggle with some kind of fear, worry or anxiety on a regular basis. Whether the fear is something that seems insignificant to some (like spiders) or is more common to mankind (like the loss of a loved one), we need to find the faith to hand our worries over to God to handle. In Fear, Faith, and a Fistful of Chocolate: Wit and Wisdom for Sidestepping Life’s Worries(Barbour Books/February 1, 2013/paperback/ISBN 978-1620291696/$9.99), Debora M. Coty uses her trademark humor to draw readers out of a lifestyle of worry and anxiety and into living life with the security of knowing that God has everything under His control. Coty addresses the five categories of fear as well as how fear leads to bigger problems such as worry, anxiety and even guilt. Tackling everyday fears — financial, health, relationships, loss, pain, the unknown, the what-ifs — both real and imagined,Fear, Faith, and a Fistful of Chocolate promises peace and hope for a better future. Readers will come away refreshed, renewed and ready to conquer their worries. To celebrate the release of Faith, Fear, and a Fistful of Chocolate, Debora Coty will be giving away Kindle and hosting a chocolate themed Facebook Party on March 7. For more details about both, readers can visit Coty’s Facebook page atwww.facebook.com/AuthorDeboraCoty. In addition to being a published author and popular speaker, Coty is an orthopedic occupational therapist and a tennis addict. 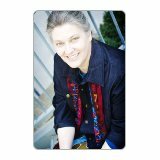 Learn more about Debora Coty and her books at deboracoty.com. Readers can also keep up with her via Facebook andTwitter.